And, yes, short-term mission trips are to some extent self-serving. Churches in the U.S. could take that same $30,000 or so (average cost of a mission trip, according to the Wall Street Journal) and spend it more efficiently by contracting out the labor and materials—to build that school or home or latrine or well—in whatever community the missionaries would otherwise go. But, as I’ve argued elsewhere, these trips must necessarily be as much about the missionaries as the people to whom they’re ministering. There’s no way around that. As affluent Americans living in relative first-world luxury, it’s sobering and often traumatic to see the way the other two-thirds (or more) of the world live. If we have a human soul, there’s no way we can go on one of these trips and not be deeply affected—and, I hope, for the better. And we naturally want to tell that story when we get back—even by showing slide shows of the trip. By all means, if all we do is go on these trips and ignore the “least among us” back home, then we’re doing something wrong. But why would it have to be that way? Why would it have to be either a trip to Paraguay or doing something for the poor here? It’s not that way in our church. In fact, in my (limited) experience, these trips sensitize us to the needs of people living in our communities. They inspire greater compassion and service when we return home. If it takes a short-term mission trip to do that, so be it. Besides, the dangers of self-righteousness still apply, whether we’re serving in the third-world or the soup kitchen down the highway. Churches can be equally smug and exploitative about the work they do locally. We’re not “saving the world” either way. That’s Jesus’ business. We’re bearing witness to Christ’s love, and—I hope—being faithful to his call. Still, thanks for the thought-provoking piece and welcome back, Ms. Drury. Your blog rules. † Thomas Oden, Classic Christianity: A Systematic Theology (New York: HarperOne, 1992), 420. According to this appreciative take on the King James Version’s 400th anniversary, the original printing of the translation had a rather unfortunate error: “Thou shalt commit adultery.” Yikes! I had never heard that before! And while the KJV gave us so many words and phrases that have become indelibly imprinted on our consciousness, did you know it also contains this phrase? In multiple places! Can you even say that in church? My favorite KJV-related story is this one. Is it a coincidence? 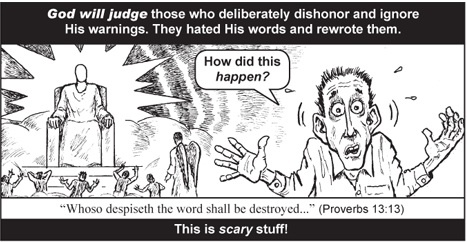 And where would we be without a Jack Chick tract warning us of the mortal dangers of non-KJV Bibles. Like I’ve always said, if the King James is good enough for the Apostle Paul, it’s good enough for me! Is it possible—and this is a frightening thought—that Jack Chick is the most widely published cartoonist ever? The more recent tracts, like the one above, appear to have been ghost-drawn. 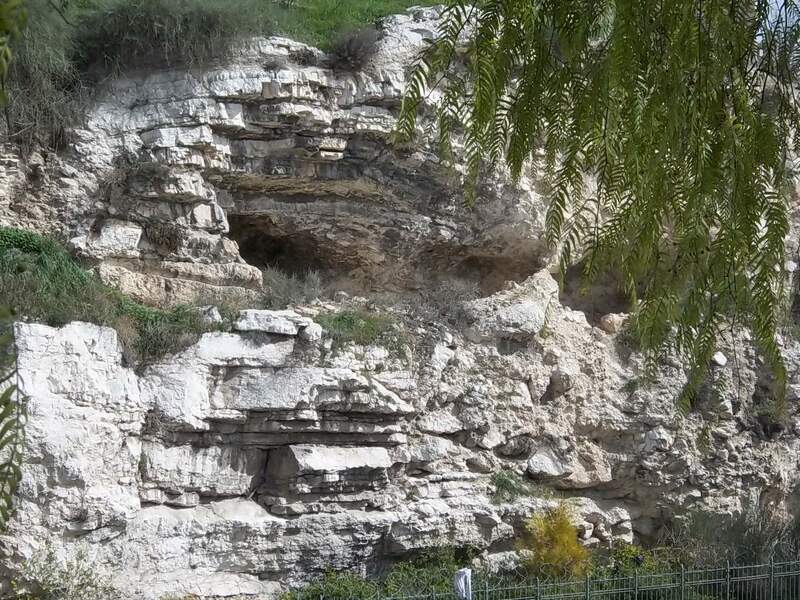 As I’m reading and preparing for this Sunday’s sermon from Matthew 27:45-49, including Jesus’ words from the cross, “My God, my God, why have you forsaken me?” I’m reminded of “Gordon’s Calvary,” a rocky hill we saw in Jerusalem on our recent trip. The tomb itself, which I’ll discuss closer to Good Friday, is a nice illustration of the type of tomb described in scripture as Jesus’ tomb. † I don’t remember what exactly he said about it in his massive tome The Resurrection of the Son of God, and my copy is not handy, but N.T. Wright reads great historical significance into the fact that Joseph of Arimathea’s tomb (in which Jesus’ body was placed) did not become a shrine for the earliest Christians (which is why we don’t know where it is). According to Wright, it speaks to their strong belief that the body wasn’t there! It’s interesting, in other words, that it had no significance to them. Our senior pastor, Dr. Don Martin, has two college-aged boys. One of his sons had spring break last week asked him if he wanted to take a few days off work, and go fishing with him in Florida during spring break. I assume that Don’s son could have gone to Panama City Beach with his buddies—or wherever else the college kids go these days. I assume he could have been off chasing girls somewhere. Instead, he asked his old man to go fishing with him. And Don is telling us about this in staff meeting, and he’s beaming with pride and love and joy. His son asked him to go fishing with him! So naturally Don is boring us with pictures and videos of the two of them fishing at Lake Seminole in Florida. In fact, according to a new book by Michael Gilmour entitled The Gospel According to Bob Dylan, a scholarly analysis of religion in Dylan’s music, Dylan and Keith and Melody Green struck up a friendship. To the surprise of the Greens themselves, Dylan even asked them, over dinner one night, to review and assess the lyrical content of the songs that would make up Dylan’s soon-to-be-released gospel album, Slow Train Coming. Regardless, song for song, Ministry Years, Vol. 1 would have to rank as one of the best albums in my entire music collection. I’ve complained elsewhere that the music of early Christian rock—mostly long out of print and unknown even to Christians who listen to CCM today—is in danger of being lost to history. This is a real shame. One philosophical difference between Christian rock then and Christian rock today, as you might sense from the video below, is that the songs weren’t simply preaching to the choir. They were often directed to non-churchgoers and spoke to broader social concerns, especially compared to the happy-clappy Christian music of today. In a way, early Christian rock is a form of protest music, spiritually akin to folk-rock of ’60s or even punk in the ’70s. If you don’t know anything about the music, you may as well start with Ministry Years. There is also a Vol. 2, which covers Green from ’80 through ’82, the year he died in a plane crash, but that collection left me cold. I haven’t heard it in years, so I can’t say exactly why. I remember that, musically, it was much softer, more ballad-heavy. Its themes were more generic, its tone preachier. Still, I think I was mostly disappointed that it didn’t measure up to Vol. 1—but what album could? Oh, my friend has life been so unkind to you? If you find a place like that, I’ll go there, too! Whether or to what extent I agree with this philosopher’s ultimate (and deeply pessimistic) conclusions shouldn’t obscure the fact that this is a very funny and thought-provoking video (who is the artist?) about the shallow and self-serving nature of consumerism. I do love the art. It would be fun to preach with an artist simultaneously illustrating ideas on a nearby whiteboard. Hey! Can anyone out there do that? The point is that there is often something very self-serving and even unwittingly harmful about what we do on behalf of others. It’s the nature of sin and evil. Isn’t this why Jesus warns that when we give alms, we don’t let one hand know what the other is doing? We so easily glorify and deceive ourselves. As I said a few years ago after a short-term mission trip to Mexico (relating this Wall Street Journal article to my own experience): We shouldn’t imagine that by building homes in Mexico, or any other third-world nation, we’re helping to “solve” a problem, without also realizing that we’re part of the problem. In spite of this, I strongly believe that we should go and build! Even if these trips are “mostly about us,” they probably need to be. We need to change, even as we make a small but important difference in the lives of the people to whom we seek to minister. My Facebook homepage was in a twitter (Ha! Notice what I did there?) this morning because of an online report about a pastor who was, according to the article, fired because he spoke up on Facebook in support of Rob Bell’s not-even-universalist-but-what-if-it-were new book Love Wins. This is nonsense. I’m not surprised that the reporter got it wrong. Reporters usually get religion- and church-related stories wrong. But shame on my fellow Methodist clergy who believe it. At the very least, it means they didn’t pay attention (at all) in United Methodist polity class in seminary. Granted, I slept through much of the class myself, but let’s be very, very clear: A local church cannot fire a United Methodist pastor. This is so fundamental to Methodist polity it almost can’t be emphasized enough. It’s one of the great strengths of our church, because in theory it gives pastors great freedom and security to proclaim the gospel with boldness. If Rev. Holtz preached or taught something that his local congregation couldn’t abide, the local church, by means of the SPR, could recommend that the bishop send them a new pastor. If the bishop agrees, Holtz would be appointed somewhere else. He wouldn’t and couldn’t lose his job unless he were brought up on charges before the conference, tried, and found guilty of some serious violation of our Book of Discipline. The Executive Session (the clergy) of the Annual Conference would then have to approve the dismissal. There’s probably more to the process than that, but to find out I would have to actually get out of my chair, walk over to my bookshelf, get my Book of Discipline out, and look it up. The point is this: What Rev. Holtz says that he said is not a fireable offense by any stretch—but even if it were, he couldn’t be fired in the manner reported. This is a non-story. Who knows what actually happened, but he’s not being martyred by the church for boldly standing up for his convictions—even if he wants to portray it that way. Say what you will about us Methodists, we are sticklers for following the rules, and the rules come from our Discipline. Click here to watch the video in Vimeo.